Axel Merk highlights how the end of U.S.$ dominance may be unfolding in front of our eyes .. "No, we don't think China's ascent is the key threat; instead, key to understanding the U.S. dollar may be to understand the money market fund you might hold .. It turns out European banks historically have had great funding needs in U.S. dollars because they extended U.S. dollar denominated loans in emerging markets, amongst others. At the time, we calculated that the average prime money market fund had half of its investment in U.S. dollar denominated commercial paper issued by (often weak) European banks; our analysis showed one money market fund of a major brokerage firm had 75% of its holdings in such paper. We weren't the only ones warning about this, and, within months, we gauged that the overall quality of investments held by money market funds improved. Sure enough, though, 'everyone' appears to be chasing yield, and your money market fund portfolio manager may not have been immune from it, either." .. points out LIBOR interest rates are increasing & new rules on money market funds .. "If our analysis is correct and there has been a massive subsidy to borrow in U.S. dollars through the old money market fund rules, then we believe this helps explain why so many borrowers wanted to get their funding in U.S. dollars. No wonder the U.S. dollar was so popular when you got a free lunch .. Some say that the dollar has to rise because U.S. rates may go up. In our analysis, real interest rates, i.e. those after inflation, may not go up as the Fed is at risk of falling further behind the curve; at the same time, interest rates in part of the rest of the world may have reached their lows. 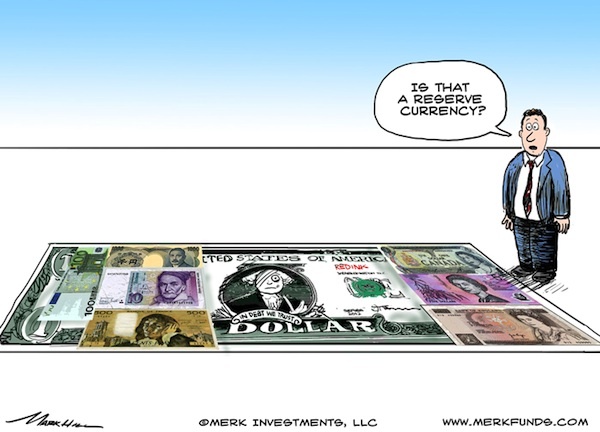 In this context, we see it is quite conceivable that the U.S. dollar could continue to weaken."